Standardized tests play a central role in educational culture in the United States. As an independent, bilingual, international school, we approach standardized testing from a unique perspective. Still, we find that participating in ERB (Educational Records Bureau) testing each year is a useful endeavor for our students and our school. For decades, ISTP has participated in the ERB’s CTP standardized tests. The CTP4 test our 3rd, 4th and 8th graders have already completed this year is a test administered to students at private schools and distinguished public schools. The ERB test broadly measures a student’s verbal and quantitative skills. ISTP participates in ERB testing on a purely voluntary basis. 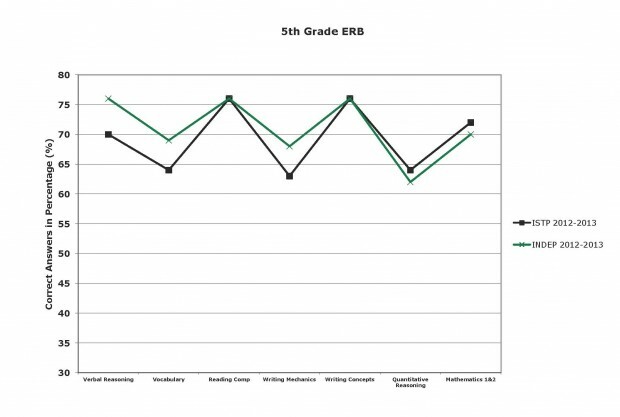 We find that ERB test scores provide us with a useful benchmark to evaluate ourselves and our curriculum contents. The scores also help to guide us in our programmatic revisions. ERB scores, along with teacher feedback and best practices, have helped us to design the best possible curriculum for our students. Additionally, we believe it is our duty to prepare students for standardized tests, which will inevitably play an important role in their future regardless of their path in life. In this sense, ERB tests offer valuable test-taking practice. When you receive your child’s ERB results, you may wonder how to interpret them. As bilingual students, ISTP students undergo a different process of educational development than their monolingual peers, which is reflected in their test scores over their time at ISTP. 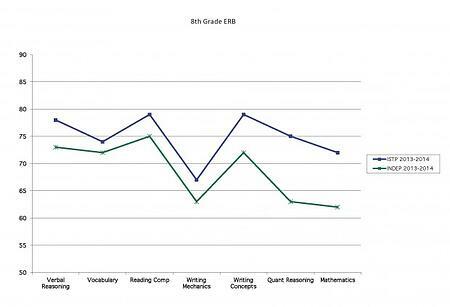 From decades of ERB testing data, it is clear that our students’ scores, and those of students in other bilingual schools, fit into a predictable pattern. ISTP expects our students’ test results to be, on average, below other Independent Schools’ test results in grades 3-4. During these years, students are learning to process, read, and write two different languages. Our Chinese Program students are learning to read and write in two completely different character systems. Their young minds are making connections between words, symbols, and meanings that are more complex than their monolingual counterparts. By 5th grade, ISTP students score about average compared to their Independent School peers. 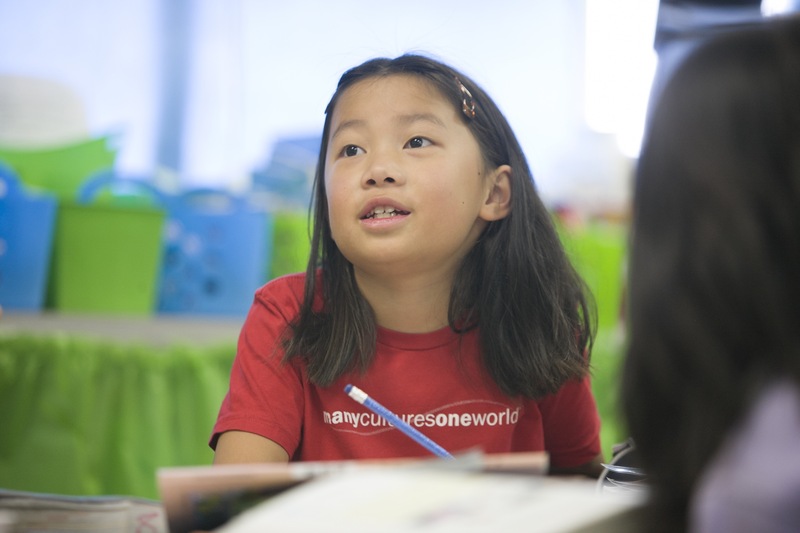 By 5th Grade, students’ dual-language abilities begin to come together, and by this time students generally score at the norm for Independent School students. By Middle School, however, the inherent academic advantages of a bilingual education begin to be expressed in student’s ERB scores. 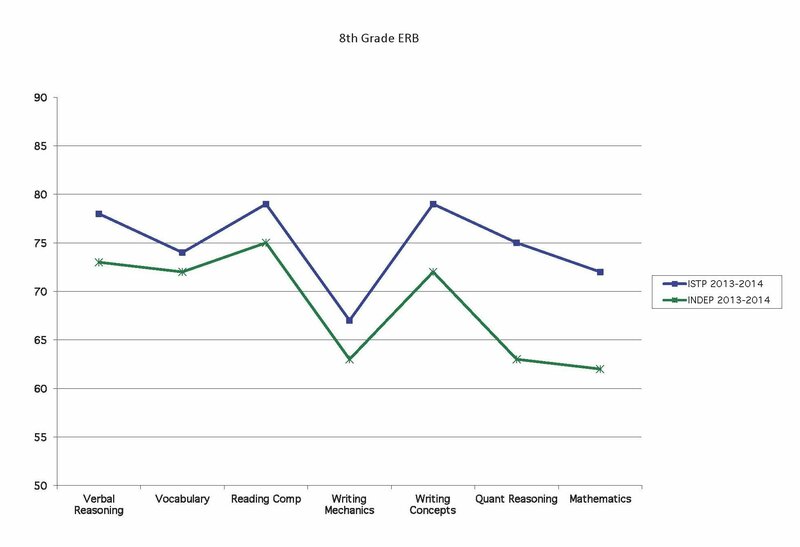 On average, the scores of our students in 6th, 7th, and 8th grades exceed the scores of their Independent School peers, in measures of both verbal and mathematical ability. By Middle School, ISTP students score above average compared to their Independent School Peers. In many ways, this pattern of excelling over time offers a fascinating glimpse into the unique development of the bilingual mind. Extensive academic research on bilingualism confirms that the pattern we observe at ISTP is typical of bilingual development. 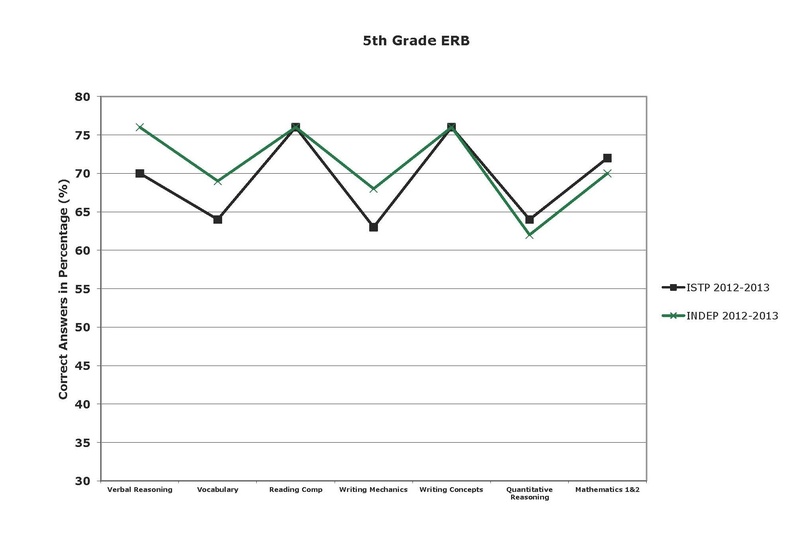 We view our students’ ERB scores in 3rd, 4th, 6th, and 7th grades as midpoint and formative assessments showing their academic progress. On the other hand, we see the scores of our 5th and 8th graders as summative assessments, providing a measure of our students’ development at the end of Elementary School and Middle School. At ISTP, we have never aligned our curriculum to the ERB test, as no test could ever encompass the depth and creativity of the education we offer. We do not prepare students for the tests, nor do we want parents to tutor their children in any way. Some parents may want to reduce their child’s education to a simple test score, and will worry if their child’s scores are below average. However, in my decades of experience as an educator, I have learned that it is the intangible skills our students learn, such as creativity, initiative, perseverance, collaboration, and communication, that are the most important indicators of future success. Above all, it is important to look at our students’ test scores in the context of their development as a whole child, and to trust in the effectiveness and advantages of the bilingual educational process.